Oatmeal cookies never go out of style, especially with all the variations achieved by adding the latest ingredients. One bite of these nostalgic treats can send you back to those carefree days spent at the kitchen table with a glass of ice cold milk and a plate of warm cookies. Heat oven to 350 degrees F. Line at least two cookie sheets with parchment paper. Have an extra lined cookie sheet on hand in case you have more cookie dough than anticipated. Use an electric mixer or a stand mixer to beat together butter, brown sugar, and white sugar on medium speed in a large bowl until mixture is creamy. Add eggs one at a time, beating well after each addition. Add vanilla and thoroughly combine. In a separate medium bowl, whisk together flour, baking soda, cinnamon, and salt until well combined. Add flour mixture to butter-sugar-egg mixture and combine thoroughly. Add oats and fully incorporate them into the cookie dough. Portion dough by using a rounded tablespoon or a 2-tablespoon cookie scoop onto prepared cookie sheets, spacing 2 inches apart. Bake 8 to 10 minutes or until light golden brown. For other sizes, see below. Remove from oven and cool 1 minute on cookie sheets and then remove to a wire rack to cool completely. Store tightly covered or freeze. Note: If using a rounded tablespoon to portion the dough, the yield will be 4 dozen. If using a 2-tablespoon cookie scoop, the yield will be closer to 2 dozen and take about 10 to 12 minutes to bake. Use 1/4 cup of dough to make monster 4-inch cookies and bake for about 15 minutes or until edges are golden brown. 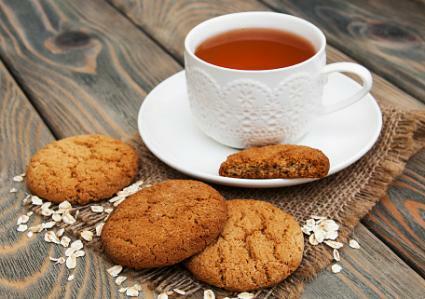 Oatmeal cookies are so versatile because their wholesome taste lends itself to a variety of add-ins. Portion and bake as directed in the basic recipe unless otherwise stated below and keep in mind that a golden-brown color around the edges is a good indication of doneness. Cookies with add-ins will yield 1/2 dozen to a full dozen more cookies. 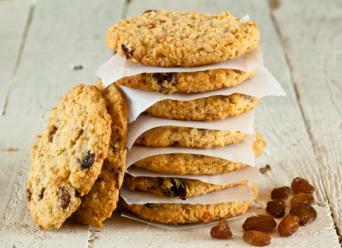 Oatmeal-raisin: Add 1 cup light or dark raisins or chopped dates. Oatmeal-nut: Add 1 cup chopped nuts of choice (walnuts, pecans, almonds, macadamia nuts). Oatmeal-chocolate chip: Omit cinnamon in basic recipe and add 1 cup semisweet chocolate chips, chocolate mint, butterscotch, peanut butter or praline chips. Oatmeal-coconut: Omit cinnamon in basic recipe and add 1 cup sweetened shredded coconut. Oatmeal-cranberry-nut: Add 1/2 teaspoon ginger, 1/8 teaspoon allspice, 1 cup sweetened dried cranberries OR sweetened dried cherries, and 1 cup chopped nuts of choice to basic recipe. Oatmeal-white chocolate-macadamia: Omit cinnamon in basic recipe and add 1 cup white chocolate chips and 1 cup chopped macadamia nuts. Oatmeal-M&M'S: Omit cinnamon in basic recipe and add 1 cup plain or peanut M&M'S. Oatmeal-peach: Omit cinnamon in basic recipe and add 1/2 teaspoon ginger and 1 cup chopped dried peaches or apricots. Oatmeal-applesauce: Replace one of the eggs in basic recipe with 1/2 cup chunky applesauce. Add 1 cup light raisins. Bake and cool oatmeal cookies using the basic recipe or any variation. Whisk together until smooth 2 cups sifted confectioners' sugar and 3 tablespoons whole milk. Quickly dip tops of cooled cookies into icing, letting excess drip off, and place on a wire rack that has been placed on waxed paper to catch any drips. Let harden and store tightly covered. Bake and cool oatmeal cookies using the basic recipe or variations that lend themselves to maple. Whisk together until smooth 2 cups sifted confectioners' sugar and 3 tablespoons pure maple syrup (not pancake syrup unless it is authentic maple syrup). Set cooled cookies on a wire rack that has been placed on waxed paper to catch any drips and drizzle on maple glaze. Let harden and store tightly covered. Pressing the cookie dough onto the bottom of a parchment paper-lined 13x9-inch baking pan. Bake 25 to 30 minutes in a heated 350-degree F. oven or until light golden brown. Remove from oven and cool completely in the pan on a wire rack. Invert pan onto a cutting board and peel off the parchment paper. This will make 24 bars when cut into four evenly spaced horizontal strips and then six evenly spaced vertical strips. Store tightly covered. A basic oatmeal cookie recipe is a good one to have in a cooking repertoire because it can be the jumping-off point for so many variations. Experimentation with different add-ins is strongly encouraged to create a winning combination for you and your family.